Hospital's Susan was in the hospital after having baby Jason. 2009: Guiding Light's Lillian visited Maureen Bauer's grave. 2010: One Life to Live's Dorian threw water on Bo and Nora. 1936: NBC debuted Frank and Anne Hummert's radio soap opera John's Other Wife. The story revolved around John Perry (Hanley Stafford), the owner of a department store, his wife Elizabeth, and an assistant secretary named Annette. John got more than he bargained for when Elizabeth started to feel as though Annette had become his "other wife." The show ran until 1942. 1966: On Peyton Place, Constance MacKenzie (Dorothy Malone) was brought to the hospital after she began feeling labor pains. 1977: On Another World, Mackenzie Cory (Douglass Watson) kissed his wife, Rachel (Victoria Wyndham), and was hurt to learn she would continue with the legal separation. 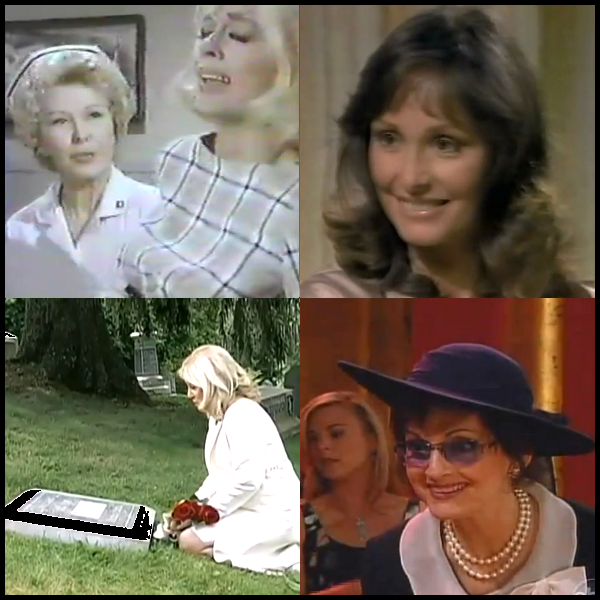 1981: On General Hospital, Alice Grant (Lieux Dressler) visited Susan Moore (Gail Ramsey) in New York where she had given birth to baby Jason the day before. Alan Quartermaine (Stuart Damon) later learned Susan had the baby. 1984: On Days of our Lives, Bo Brady (Peter Reckell) and Megan Hathaway (Cheryl-Ann Wilson) talked to the Parkers about getting custody of Zachary (Brian Autenrieth). 1987: On Another World, when Chad Rollo (Richard Burgi) told his sister, Dawn, that he had been the one supporting her and not their mother, she revealed she already knew. 2004: On The Bold and the Beautiful, Jackie Marone (Lesley-Anne Down) informed Ridge Forrester (Ronn Moss) and Eric Forrester (John McCook) that she had been invited to the Spectra show, and that Fenmore's Department Store was considering carrying Spectra designs. Thorne Forreter (Winsor Harmon) felt appreciated at Spectra as excitement built towards the new collection. 2006: Terry O'Sullivan, who played Arthur Tate in Search for Tomorrow, died at age 91. His other soap roles included Richard Hunter in Days of our Lives, Judge Sam Stevens in The Secret Storm, and Elliott Norris in Valiant Lady. 2009: On Guiding Light, Lillian Raines (Tina Sloan) visited Maureen Bauer's grave before her wedding to Buzz Cooper (Justin Deas). 2010: On One Life to Live, an upset and hallucinating Dorian Lord (Robin Strasser) threw a glass of water on Bo (Robert S. Woods) and Nora (Hillary B. Smith) Buchanan.